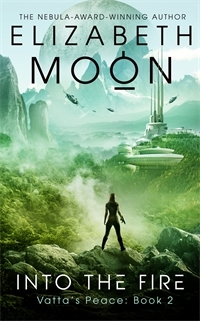 Nebula Award-winner Elizabeth Moon triumphantly returns to science fiction with this space opera series – Into the Fire is the sequel to Cold Welcome and perfect for fans of Lois McMaster Bujold, James S. A. Corey and Star Wars. Ky Vatta stood looking out the upper-floor window of the Vatta home in Port Major, just above the entrance. Below, she could see the brick walk bordered by low shrubs pruned into balls, the perfect green lawn, the white-painted palings and gate through which she and Rafe had entered a few hours before. A chill draft came off the window, reminding her that she was still in the beach clothes she’d put on before leaving Corleigh just that morning. If Stella and Helen hadn’t arrived on Corleigh yesterday, if she and Rafe had gotten back to the mainland when they planned, it would have been warm here, too. She could almost feel the elation of the previous morning as they packed to leave the island, planning to buy their own ship and leave Slotter Key together. Her fortune, they’d thought—her back pay, her savings banked on Cascadia, and the money Stella owed her for the shares Ky had given up—combined with Rafe’s personal fortune and the stipend he had from ISC, would be enough to buy a spaceship, hire some crew, and go wherever their interests took them. But then . . . it had all fallen apart. Stella and Helen arrived because the house—this house—had been attacked, a door kicked in, and Helen had feared for the children. They’d brought the news that the money Ky had counted on to help buy a ship—her back pay from Space Defense Force and money owed her for the sale of her shares of Vatta Transport and Vatta Enterprises—had been sequestered by the government of Cascadia, because she was being blamed for the death of her former aide Jen, whose father was on the Grand Council of the Moscoe Confederation. Stella’s position on Cascadia, Vatta’s secondary headquarters, was threatened, as well. Ky’s own accounts here on Slotter Key were also frozen because of the deaths on Miksland. The evidence she’d collected so carefully from the crashed shuttle and from Miksland had gone missing—the evidence that could clear her of suspicion that she’d murdered those who died. So much had gone wrong; probably more would. The gray sky outside matched her mood. She felt alienated from the house, the city, the entire planet; eight years of physical separation, the attack—she wasn’t even sure exactly how long after she’d left—that killed her parents, her brothers, her uncle, Stella’s sister and brothers. It was too different—no, she was too different. She didn’t fit into the Vatta family structure anymore. She didn’t have a place in Slotter Key’s military; she no longer had her own fleet, the fleet she had built from one old battered tradeship. The men and women she’d commanded—those who knew her best—were either dead or far away, in the Space Defense Force. Her throat tightened; her stomach churned. She took a deep breath, forcing herself to think forward and not back. She had things she could do, things that might—though it was hard to believe—be as interesting, as worthwhile, as what she’d already done. First she needed to find out what had happened to the evidence she’d brought back from Miksland, evidence that would clear her of charges of murder for every death that had occurred. Then find a way to convince the Moscoe Confederation that she had not killed Jen Bentik, so they would release the lien on her funds. And she needed to know how the other survivors from Miksland were doing. By now, they should be almost through the home leave she’d been told about, ready to return to duty. Grace, as Rector of Defense, would be able to get their addresses for her. And—if she was stuck here long enough, all the way to the next southern summer, she might even return to Miksland, explore the deep levels, those mysterious laboratories, maybe even figure out who had built them. Rafe didn’t have enough money for a spaceship, but he certainly had enough for a charter flight. Scientists were probably down there now. It would be safe, with Greyhaus’s people far away and the mercenaries dead. Whoever had first claimed it surely wouldn’t dare do anything now that it was public knowledge. She looked across the street to another front garden as formal as the one below, and the white brick house behind it with its flagstone walk, its rows of shrubs pruned into little pyramids. The second floor was built out over a rounded portico, forming a curved row of windows. Handy for neighborhood snoops, if there were any. Rain spattered the window, a swift rattle that broke into her thoughts. Across the street she saw a curtain twitch, opening a dark gap, but she couldn’t see anyone. So there was a neighborhood snoop. Below, a black car pulled up in front of the house. Stella got out, accepted her travel case and two white containers from the driver, then tapped the code onto the front gatepost. It opened for her. Ky saw someone step out between the portico columns of the house across the street, and then disappear again. Stella waved the driver away. Ky went back to the stairs and down in time to see Rafe open the door. A gust of cold wet air swirled in when he pulled it back. After supper, eaten quickly and almost silently, they made the rounds of checking doors and windows. As Stella looked out the double glass doors into the back garden, she shook her head. “I should have checked before supper. There’s that miserable stuffed pony, getting wet on a swing. Justin loves it. It’ll mildew if I don’t get it in the dryer. And the ball looks tacky out there.” She turned on an outside light, opened the door and went out, crossing the terrace and then the grass; Ky stayed back, away from the cold wind and rain, watching. Stella came back, raindrops in her hair sparkling in the light, the wet stuffed toy in one hand and the ball in the other. Just as she came into the house, the door chime rang and someone knocked on the front door. Ky had no desire to visit with company; she ducked into the short passage to the kitchen as whoever it was pounded harder on the door. Rafe, she noticed, had followed Stella. Ky found the dryer, tossed the stuffed toy into it, and stared at the dials, finally deciding on GENTLE. She dried the wet ball with a kitchen towel, then sat down at the kitchen table. She could just hear Stella speaking, though she could not distinguish the words. The tone made it clear Stella was upset. In a minute or so Stella was back in the kitchen, color in her pale cheeks. “The utter nerve—” she was saying to Rafe, who followed her. “Of course not,” Ky said. “We should see what’s on the newsvids,” Rafe said. “Surely there’d be something about a prison breakout.” He led the way to the security office next to the lift and turned on another screen. A serious-faced man was explaining what cut of cattlelope to choose for braising. A streamer at the bottom carried ads for cookware shops. Rafe changed selections. Two women and three men were arguing about a recent election on Dorland and what it meant for the balance of power in the planetary legislature. Here the streamer carried what Ky recognized as financial news. Another try gave them an obvious drama vid, with a stationary block giving time, temperature, wind speed, and wave height. “It upset him?” Ky leaned on the wall, out of the draft coming in the door Stella held half open. “Yes.” Stella looked outside again, where Rafe was a vague blur in the dark. “Why military police?” Ky asked. “I don’t know,” Stella said. She glanced at the kitchen door, slightly crooked in its frame and braced with a couple of boards nailed across it. “But I hope they’re wrong about any escaped military criminals. That boarded-up door does look like an easy place to break in.” They watched Rafe move along the front of the shrubbery and waited for him to turn back toward the house when he reached the garage wall. Instead, he stood still. “Or someone,” Ky said. She moved her pistol from her shoulder holster to the pocket of her shorts. Then Rafe turned back toward the house, walking steadily, not looking back, and behind him the first figure came out of the shrubbery. Then another. And another. They were hard to see in the rain and poor light. Ky heard Stella’s indrawn breath, Rafe’s sandals scuffing in the damp grass, and behind him, other footfalls, softer. He stepped onto the terrace, walked across it, his sandals slapping lightly on the bricks. He quirked an eyebrow at her. Behind him, just visible in the dim scattered glow of his handlight, she could see the first of the three following him: short and slight, a bald head paler than the brown face, wearing some kind of thin garment—a robe? Rafe stepped inside and walked on, turning around as the three came in: all women, Ky could see now, shivering as their wet clothes clung to them. All were bald, scalps and faces completely hairless. Were these the escaped criminals? They didn’t look like it. Their legs were bare from well above the knees, their feet in thin, now-sodden cloth slippers. Stella shut the outside doors and pulled heavy linen curtains over them. Ky fought to keep her expression calm despite a surge of rage at what had been done to them. They did not need her rage; they needed her help. “Stella, lock us down,” Rafe said. “No—and we don’t know what, or why—they separated us—they changed our implants—” Inyatta’s voice was shaky as she clambered up; she was shivering. “You won’t send us back?” Again, the voice gave her the identity: Corporal Barash. “Please!” The third had not spoken at all, and Ky hadn’t figured out who she was yet. She had a fresh scar, a raised red-purple ridge, on her head, and puffy swelling that changed whatever her face had been. “No, sir. We ate the paper off the fruit bars.” That was the third, and again the voice gave Ky the identification. Kamat—that was Durga Kamat? The shaved head, scar, and puffiness obscured what had been an unusual beauty. What had happened to her—to them—and what about all the others? Questions erupted in her mind, but right now these three needed care. “Yes, please.” They were clustered in the doorway, staring at all the flowered chintz. She kept her voice level and calm, for their sake, but when she went back into the hall, her anger shot up like a geyser, dimming her vision for an instant. All of them must have been taken, drugged, held. Separated, Inyatta had said. Probably early on, perhaps even at Pingat Base while she had been on a flight to the mainland. Who had done this to her people? And how? Why hadn’t Great-Aunt Grace made sure the other survivors were properly taken care of? She should not have agreed to fly back separately—she should have thought—but too late for that. First things: take care of these three. She crossed the head of the stairs and met Stella coming back with a stack of folded clothes. “I don’t have any money, remember?” Ky said. Her voice had an edge to it; she wished she’d softened it. “Vatta tab.” Short and flat. Ky found the three women perched on the couch, wrapped in blankets, when she returned with a pile of Stella’s clothes. She set the clothes on the end of one bed and explained the plan for tomorrow. “What if they come here looking for us?” asked Inyatta. Barash nodded. Kamat stared at her own lap. The three passed it around, each one trying it on. It looked entirely fake, and didn’t fit two of them, but Corporal Barash wanted to keep it on. Kamat asked if there was a scarf she could wrap around her head; Stella ducked into her room and brought out a tray of them. Kamat and Inyatta each chose one and put it on—one green, one orange. With the baldness covered, they did look more like themselves. “How did you escape?” Ky asked. Ky nodded but didn’t interrupt. As she’d thought . . . they were all taken, and now she would have to find them, somehow, and get them released. “You’re safe here,” Ky said. “So get some sleep—we’re all on the same floor—and in the morning we’ll start figuring out how to help all of you.” She yawned; she couldn’t help it. “Were you here in Port Major the whole time?” asked Barash as she stood up and put her soup bowl in the little sink. “You can’t believe that,” Stella said. “Not exactly. She did tell me she’d killed some people, that she’d been scared a lot.” Stella’s voice was cool, calm, as if whatever had happened to Grace didn’t matter in the slightest. “I want to talk to her now—” Ky could feel the anger boiling up again. The tone ripped the last shreds of Ky’s control. In just that calm, almost syrupy voice Stella had insisted Ky’s earlier enthusiasms and angers were unreasonable overreactions. Older to younger, senior to junior. “You do not get to tell me who my people are or aren’t!” Ky said. “You weren’t there, you don’t—” Someone had hold of her arm; she spun, freeing herself, and struck before she realized who it was. Rafe, who had slipped the worst of the force and now stood just out of reach, poised in case she attacked. “Ky!” Stella said, now roused and angry. “Don’t,” Rafe said to Stella. She stepped back, frowning. Ky felt the rage subsiding as if it were a column of boiling water leaking out of a pipe. “Yes. Some.” She felt sore, as the tension dropped, sore and tired inside and out. Stella made it to her own suite, closed the door behind her, and let loose a streak of language that Ky probably did not suspect she knew. How dare Ky treat her that way! Ky hadn’t even spoken to her on the flight back from Corleigh, had just sat there sulking, as if Stella were responsible for the bad news about her money and missing out on a longer vacation with Rafe. The problem wasn’t just money. Ky didn’t have a ship to boss around anymore, a crew that hung on her every word and thought she was wonderful. She was feeling sorry for herself and probably believed Stella had it easier because Stella still had both the homes she’d grown up in, a mother alive, and Jo’s children as a promise of the future. Not that she’d really wanted children. But still. The things she might have said to Ky, wanted to say to Ky, boiled through her head, vicious and potent as vitriol. Ky was the lucky one. Ky’s parents had been her real parents; yes, they were dead, but she was not being hassled by a live “mother” who wasn’t, a woman riven by grief and fear, whose only real grip on life was the twins she clung to. And yet Ky, as always, had grabbed the moral high ground, eager to play rescuer to those three peculiar-looking women, no doubt eager to have them kneel at her feet again, bask in their adulation of the great, wonderful Admiral Vatta who had saved everyone. She was sweating now, pure fury hot as summer sun. All the quarrels in their past rose up, all the times she’d been told Ky was smarter or more sensible. Her daysetter chimed, reminding her it was time for bed. She took a shower instead, letting the familiar beat of hot water on her shoulders relax them, inhaling the fragrances designed to calm, until she could think more clearly. She was the elder. And she was CEO of Vatta, all of it, responsible for the businesses, the employees, their families. That was where her energy should go, not on trying to fix her stormy younger cousin that no one else had ever been able to fix, either. Elizabeth Moon served in the US Marine Corps, reaching the rank of 1st Lieutenant during active duty. She has also earned degrees in history and biology, run for public office and been a columnist on her local newspaper. She lives near Austin, Texas, with her husband and their son. Twenty-six of her books are in print, and she won the Nebula Award with her science fiction novel Speed of Dark (also shortlisted for the Clarke Award), and was a finalist for the Hugo in 1997.